German automaker Daimler has plans to launch two new buses by 2018. One of the buses will be called the Citaro E-Cell and will be powered by a conventional battery system. The other, however, is dubbed the Citaro F-Cell and will make use of a hydrogen fuel cell system. The two buses will join the others that Daimler already has on offer, which include a variety of those powered by diesel and compressed natural gas solutions. The buses will be made available through Daimler Buses, which believes that the buses will be available by 2018. Several divisions of Daimler are working on improving clean technology to make better vehicles for the transportation space. Daimler has shown relatively modest interest in hydrogen fuel cells, believing that these energy systems may not be able to compete with advanced battery technology that is being developed currently. The lack of a hydrogen infrastructure has also affected the automaker’s faith in fuel cells. Without hydrogen stations being available to the public, fuel cell vehicles have less appeal to consumers. The infrastructure issue may not be overly problematic for Daimler, as its buses will likely have access to all the hydrogen fuel that they need to function properly. Daimler’s battery-powered bus will benefit from an already established infrastructure, granting it access to the electrical power that it needs. The fuel cell version of the bus, however, can be fueled in a matter of minutes, whereas the battery version may take several hours to fully charge. Several automakers have taken to developing fuel cell buses in recent years. The demand for these buses is growing quickly as several cities and governments throughout the world aim to reduce pollution and promote clean transportation. 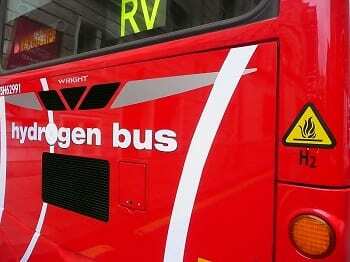 Buses powered by hydrogen fuel cells are particularly attractive as they produce no harmful emissions and do not require the long charge times associated with their battery-powered counterparts.